We’re getting a LOT of questions about what kind of impact the drought is having on California rafting trips in 2014. Let’s clarify the matter: we have plenty of water for great rafting trips this year because of upstream reservoirs. Our handy-dandy map shows you when and where all our rivers are running this season. Family-friendly and fabulous, the South Fork is your go-to river for groups with first-timers and Nervous Nellies, but it’s certainly no float trip. Class III rapids abound and even experienced rafters will have a hoot on this, the most popular river in the state. Trips are running now and into the fall! Tunnel Chute rapid has to be one of the coolest rapids in California–it’s a heart-pounding ride down a chute literally carved out of solid rock that ends in a placid float through a small hill. What??? Yes, it’s true, and you gotta see it to believe it. Plus there’s another 17 miles of wilderness canyon with class III-IV rapids and calm stretches for day-dreaming and relaxing. Middle Fork river trips will run May-September. Man, the Tuolumne is a keeper. It’s a beautiful and wild canyon with a heart of gold that refused to be put out by the 2013 Rim Fire. See the recovery process up-close and personal on a Tuolumne river trip this year–we’re already running trips and will be out there until September 1st, 2014. Class V Cherry Creek is the most challenging commercial river trip in the United States. And the drought is actually doing it a huge favor–because there isn’t a big spring snowmelt, which has to subside before the river is low enough to run in typical seasons–Cherry Creek is actually going to be available for trips much earlier this year. Our season starts May 3rd and ends September 1st. The Merced is one of the few free-flowing rivers to have a spring season in California this year. Located near Yosemite Valley, this class III-IV river runs April to early June in 2014. 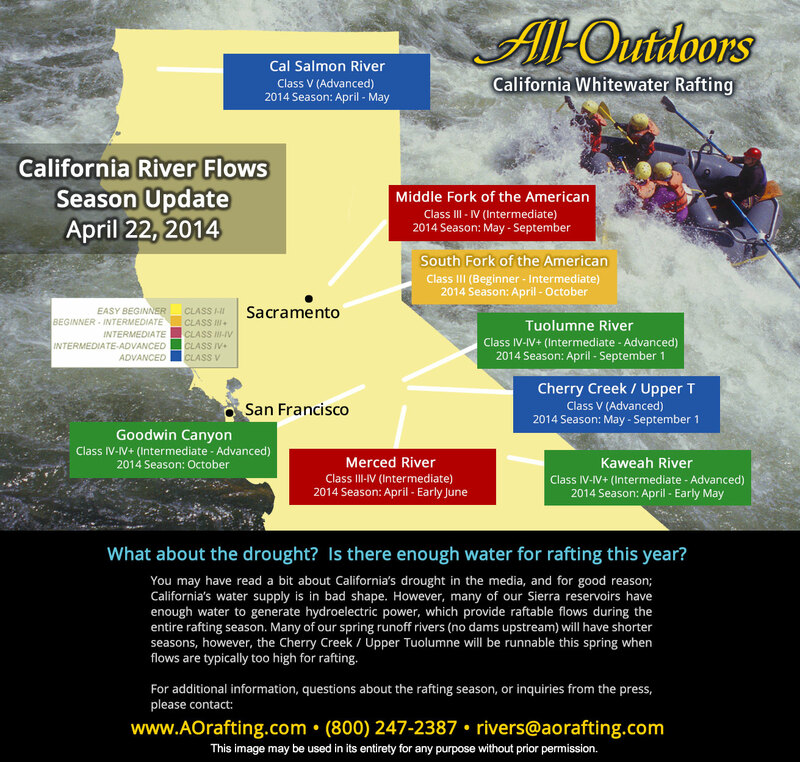 Because it’s fed by snow melt (of which there isn’t a ton this year), the Kaweah will have a short season in 2014, just a few action-packed weekends in late April and early May. If you’re ready for a last minute adventure to make the road trip up north, this weekend we have one epic class IV-V weekend (April 26-27) on the Cal Salmon. The season here will last through May, but this is a river that we don’t run every day, so be sure to call in advance to book ahead. If you’ve been wanting to check one of our spring runs off of your bucket list, right now is the best time to book that trip. Not only are the river canyons more beautiful in the spring, but it’s the only time of year you can raft on the Merced, Kaweah or Cal Salmon. (The North Fork of the American or North Fork of the Stanislaus are not expected to have a season this year.) And this year, Cherry Creek will have a full spring season, which almost never happens because flows are usually TOO high. And in case you haven’t seen it, we are running our annual Spring Sale right now; if you book by April 30th and raft before June 30th, you will save 20% off your trip for groups of any size. Need help making plans? Get in touch, we want to help!